﻿Published by Sareth Ney on Nov. 7, 2015 at 12:16 p.m.
PUEBLO, Colo. – 2015 Pueblo 24 Hour Film Festival will begin at 11 a.m., on Nov. 7. Production will conclude on Nov. 8, at 11 a.m. This year, Derrick Mason will be taking over the direction of the festival. He is the Idea Factory (Makerspace) Librarian at Pueblo City-County Library District. With the new change, there will be no registration fee for students of Pueblo School District 60 and 70. On Nov. 13, the red carpet screening and award presentation will take place at 7 p.m. It will be at the Rawlings Library and inside the Ryals Room. The doors will open at 6:30 p.m.
Each film must be six minutes and 30 seconds long. They must also incorporate a location, a quote (spoken or seen) and specific props. If one film crew were to use music or sound clips, they must have permission by the person who produced it. Submissions from the Pueblo 24 Hour Film Festival will be accepted in many ways including: Vimeo, YouTube, Instagram or Vine. The links to the online submission must be emailed to idea.factory@pueblolibrary.org. Flash Drive and SD Card submission will be accepted between the hours of 12 a.m. and 5 p.m., on Nov. 8. 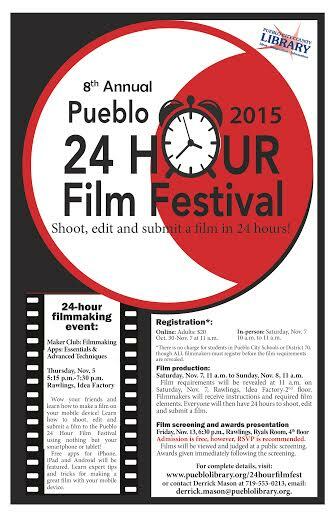 Judges of the Pueblo 24 Hour Film Festival will view the submissions at the same time as the audience. Creativity will be worth 25 points. The storyline, use of the required location, props, the quote and cinematography and editing will be worth 15 points each. The total possible points earned will equal 100 points maximum. If any of the films include offensive, sexually explicit or violent content—Pueblo 24 Hour Film Festival reserves the right to disqualify the entries. If the submissions of the Pueblo 24 Hour Film Festival meet the requirements of the points system, they will be eligible for the following awards: Best of Festival, Most Creative, Best Cinematography, Best Performance, Audience Choice and Best 15 Second Movie. The last category will is the newest one added to the lineup of awards and it must be shot or edited via Instagram or Vine. One-of-a-kind awards were made by Kate Fox and Gabe Wolff of Foxy-Wolff. When the screening concludes, the awards will be handed out immediately after. To visit the Pueblo 24 Hour Film Festival website, please click here. To like them on Facebook, please click here. To register and participate in the festival, please click here.